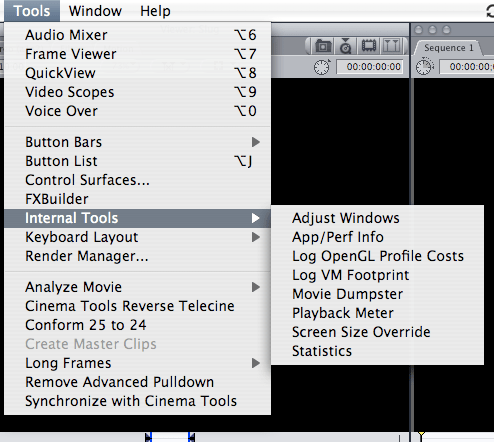 Want to unveil as hidden set of “Internal Tools” in Final Cut? First clink on the tools menu. Take not of the items in the menu. Now how down shift option command (the apple key) and click on the tools menu again. See something new? You have just activated the “Internal Tools” menu, a collection of useful and potentially dangerous items. So use these with caution. I have found the playback meters to be the most useful item, it will tell you how well your system is keeping up with the video and audio that you are pushing through it.